I love Day In The Life posts, and so do you (from the last survey I did). So ... here's how my day went yesterday. 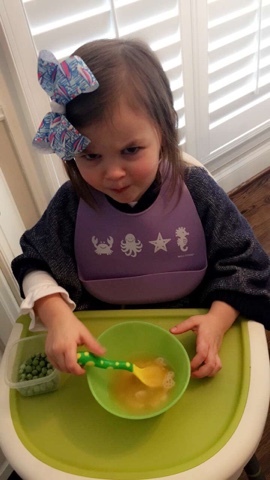 It was a non-preschool day for Camille which made it a little different. 6:09a: Ian's ready for the day and telling me goodbye. He's not always up this early, maybe one or two days a week. I secretly love it because it forces me to get up early and start the day. 6:25: I am sitting at my computer with a cup of dark roast coffee and a detoxing mud mask on. 6:48: I place a bid on eBay for a pair of pants I'd love to have in my closet. It's been forever since I've bought or sold on eBay but I do enjoy it. Then I hop over to Blogger and start my blog post for the day. 7:06: Blog post is up. Truth or dare -- a quick one to write, but it will take time to work on during the day with the comments section. 7:15: I shower and run a load of laundry. 7:29: Camille tosses the books from her bed to the floor. She does this every single time she wakes up (she loves having books in her bed). 7:30: Camille's OK to Wake clock turns green and she calls for me. I go up, get Camille, go over to Charlotte's room with her, change both of their diapers. I nurse Charlotte while Camille plays. 8:00: Breakfast time for us. 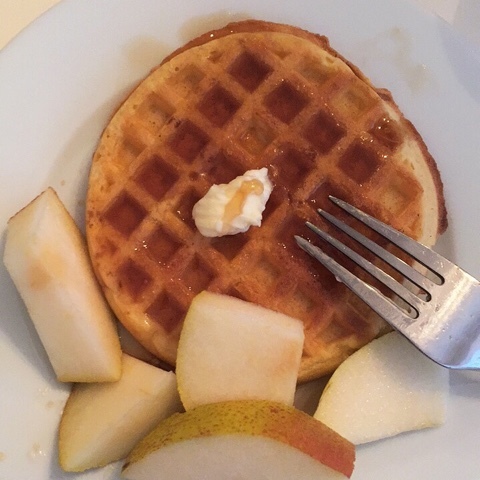 Waffles and pear slices for me and Camille, organic puffs for Char. 8:33: I make my 2nd cup of coffee. I only let myself drink one cup before nursing Charlotte, so when I'm done, I like having a second cup. Between now and 10:45 we are doing Frozen puzzles, cleaning up from breakfast, tidying up the house, going back to my bathroom to get ready for the day. I bring clothes for each girl down to our bathroom. I do my makeup and dry my hair (Camille is watching YouTube videos and Charlotte is jumping in a doorway bouncer). I get them dressed. We go upstairs to the playroom afterwards and they play while I get some bows organized to take to a local childrens' boutique. 9:45: I nurse Char again and tidy the house, getting the girls ready to leave. 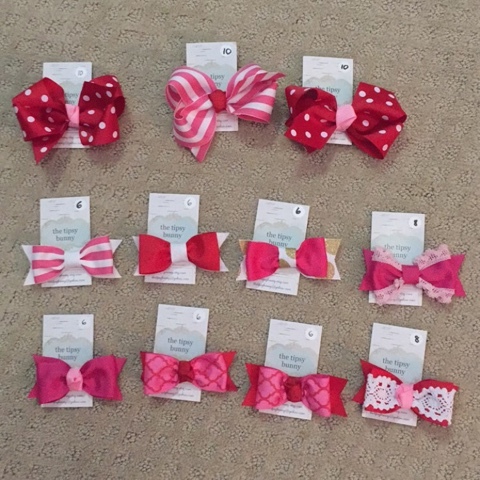 10:45: We load up the care to head to The Argyle Alligator to shop and switch out the holiday bows I have there for some Valentines bows. They have this little mom meet-up event going on so it's the perfect day for me to stop by. 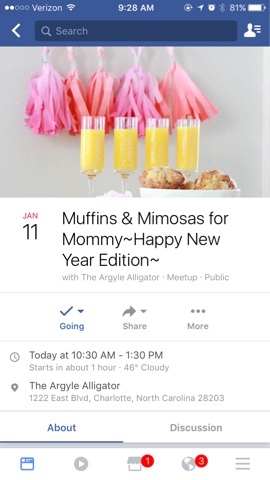 11-12:15: We are at the Argyle Alligator. Camille loves the little play area for kids -- she plays with Elsa, a stuffed Minnie Mouse, and wears Cinderella dress up shoes around the store. I bought Camille a poncho for $11 and a baby gift. And now they have my Valentines bows there! 12:45: We are back home. 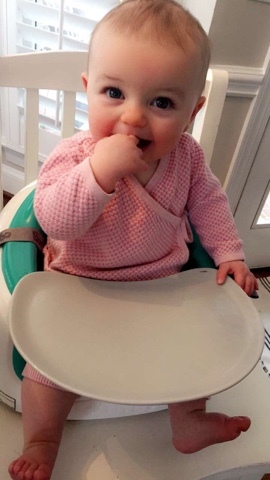 I feed Char baby food (organic chicken and rice puree), Camille eats chicken noodle soup with cheese toast and frozen peas, and I eat leftover pulled pork and lima beans for lunch. Leftovers from the night before always makes for a great lunch. 1:30: Nurse Charlotte and get her down for nap around 1:50. 2:00: Reading One Fish Two Fish to Camille and we both lay our heads down on her carpet and rest. I never do this. Usually I have energy for days. Luckily a girlfriend texts me around 2:15, I wake and put her in her crib, turn on her sound machine, and go downstairs. I clean up from lunchtime and make a cup of coffee and have two squares of chocolate. 2:15-3:30: Transfer over 2000+ photos from my phone to my laptop to clear up space on my iPhone. Fold clothes, Try to organize my closet. Wash dishes and load dishwasher, run it. Ian gets home from work around 3 and then leaves after a while for the gym. 3:30: Camille's awake. I take her to the playroom and give her some caramel rice cakes for snack with a cup of water. I turn on Doc McStuffins for her. She is allowed to watch two shows each day after nap. I make hairbows in the same room. 4:00: Charlotte is awake. I walk into her room and see her pulling up for the very first time. She's not standing up but she is pulling up to a kneeling position. Yikes. 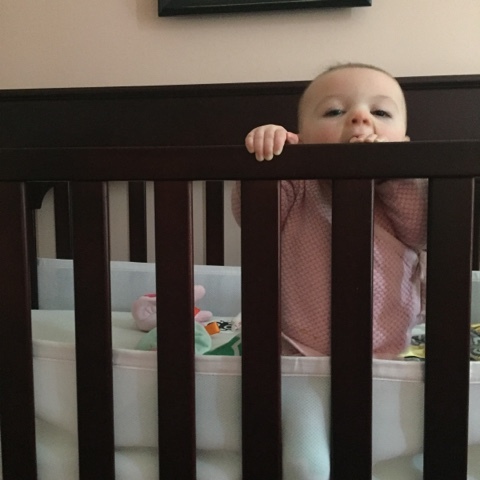 We had to install these breathable crib bumpers in her bed because she was getting her chunky thighs stuck in the rungs. 4:05: Charlotte has more milk and then we all play a little bit in the playroom. 5:00-5:45: We play outside. Ian gets home around 5:15 and joins us on our wagon ride. 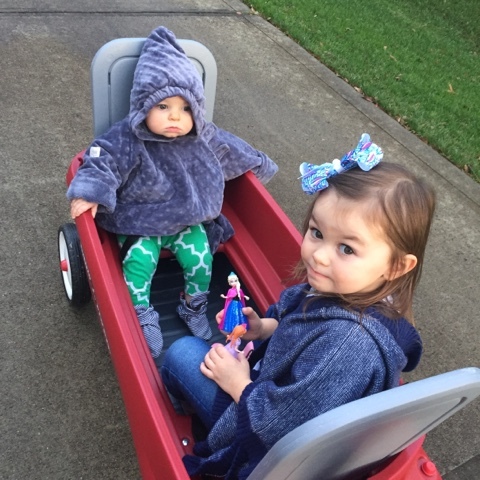 This is the first time Char has ever sat up in a wagon. She is loving it. 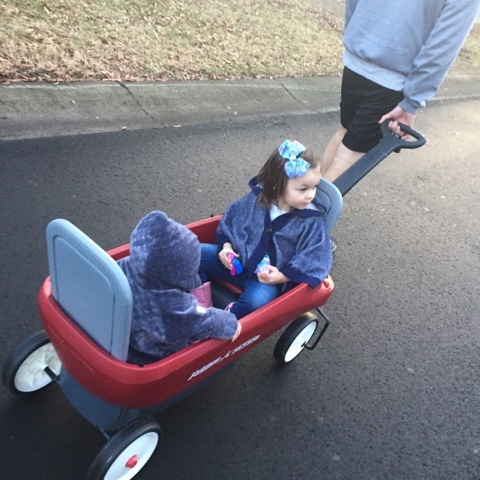 Camille also bikes a little after the wagon ride and is getting really good at pedaling. 5:45: Dinner for the girls. 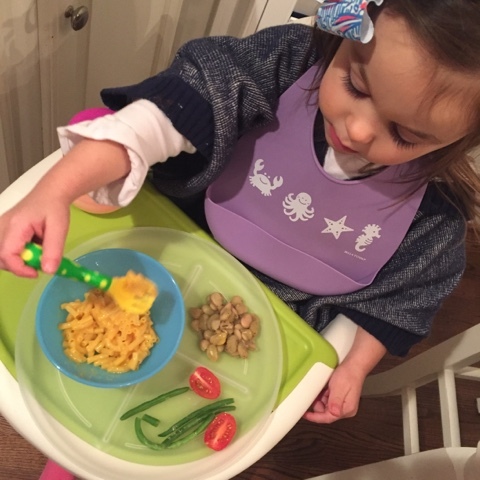 Camille has macaroni, lima beans, green beans and tomatoes. She has a jello fruit cup for dessert, it's her favorite. 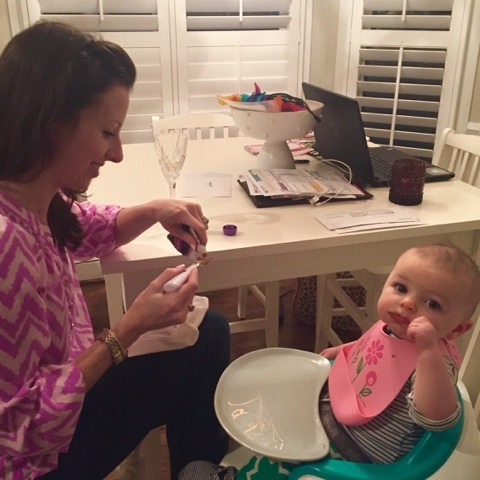 Charlotte has pureed prunes with her Vitamin D drop. Mama has a glass of wine. While they are in their high chairs I run back to our bathroom and start the bath water. 6:30: The girls are in the bath together. I already have their jammies and fresh diapers on the bathroom floor for ease. I get them dressed right out of the tub. Ian takes Camille up and I take Charlotte up and nurse her one last time before bed. I read her a story and sing Twinkle Twinkle to her. Ian is in Millie's room getting her teeth brushed and reading to her. After Char is down, I pop over to Mill's room and let her tackle-hug me once and then we sing songs and I put her to bed. It is a little after 7pm. 7:15-8: I finish cooking dinner, tidy up the kitchen, and catch up on Instastories. I cut a whole pineapple up and start prepping Camille's preschool lunch for the following day. 8:00: We eat dinner together at the kitchen bar and talk about our days and the upcoming weekend. 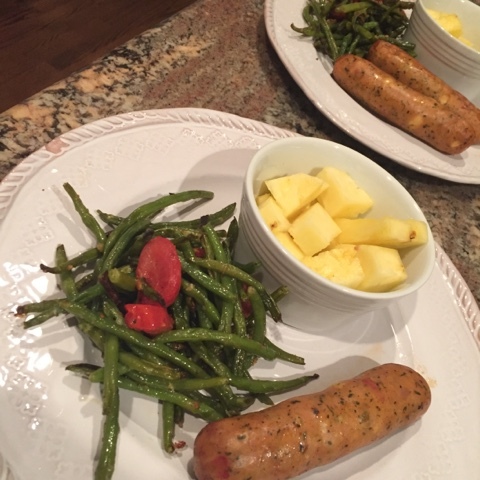 We have chicken sausage, roasted parmesan green beans and tomatoes, and freshly cut pineapple. 9:35: Print shipping labels for Tipsy Bunny bows I sold. Grab shipping envelopes. Message buyers on Instagram and send invoices. Package up two orders to go out in the morning. 9:53: Back to get ready for bed! Love another Mama's SAHM day! ...& LoVe the real stuff...catch-all bowl on the table. Papers around the laptop. Toddler watching YouTube while you get ready. Icing, out of the package, with a toddler spoon. Hilarious! Well done!! 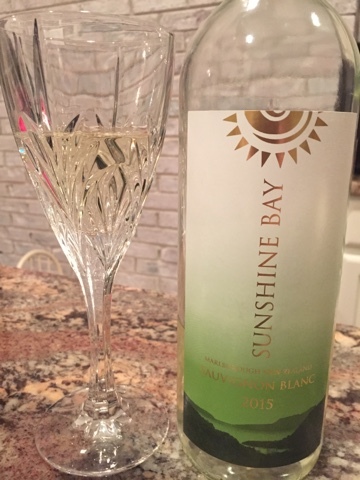 The cream cheese icing and wine. Crying laughing. Love these posts!!! Such a fun busy day. I would love to know what YouTube videos Camille watches. It cracks me up that these kids love them so much. Brody used to be obsessed with Ryans Toy Review but now he watches a channel called Daily Bumps. Have you heard of it? it's like reality vlogging. I think it's so random that he likes it. Its a family of four with two young kids and they film their everyday life!! 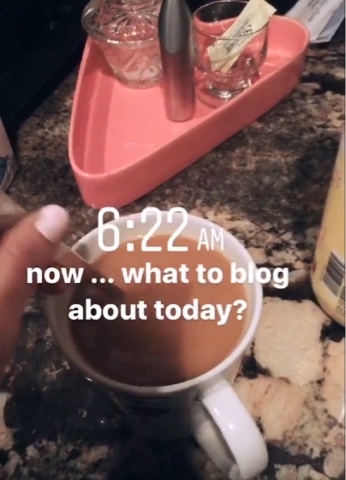 Question about little Charlotte's routine! Webb and her and like 2 weeks apart. What is normal nap schedule?! I hate the morning nap so much! These are my favorite posts! So glad you shared! 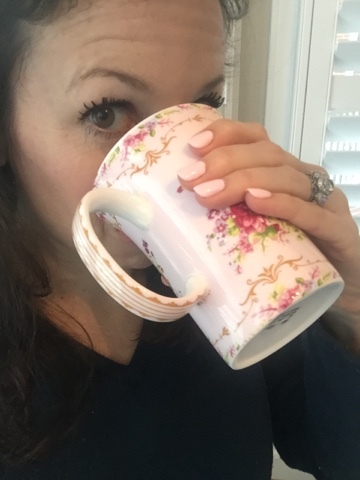 Love this post and an inside look at how busy, yet wonderful, it is being a SAHM! I am transitioning to part time at work next month and will be home with my toddler Monday, Wednesday, and Friday. I can't wait! 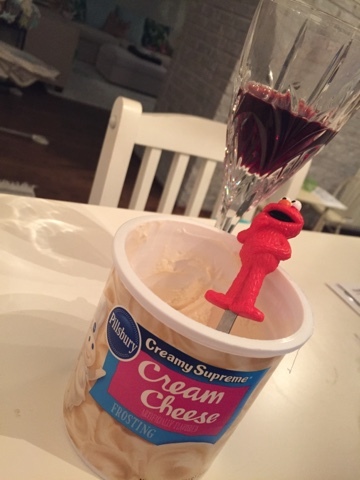 Frosting and wine --- you are the best. Love this post. You manage to do so much during the day with two young ones. It gives me inspiration! Red wine and cream cheese icing, are you my long lost sister?? Haha! I love reading day in the life posts, they are some of my favorites. these are great! I'm currently working on a "peek into my week" which is similar but not so detailed! Love the icing and wine too! Sounds like the perfect dessert! I would love to see a post dedicated to toddler sleeping, specifically the use of the OK to Wake Clock and if you've transitioned Camille to the toddler bed yet :) Thank you! I LOVE these posts! You should do one every month! They never get old. I second the questions about Char's nap schedule and Camille's okay to wake clock! I have a 9 month old who is fighting naps and I recently got my newly turned 2yo the okay to wake clock but realize it's a bit too early for her to understand how it works. Any tips? I think the Elmo spoon makes the whole post, lol! I do love these posts!! I love reading them! Always my favorite posts....I love your glimpses of solo time....it's my key to a good day, but they can be hard to find. love love these posts! You are one busy mama!! i'm so impressed with how much you get done during nap time..usually i'm parked on the sofa, even though there are many things I should be doing! Does Charlotte nap in the mornings or just on the go? Both girls seem so easy going, you are lucky!! Another post idea for you - things you do well vs things you don't do at all (like "I'm great at staying on top of housework but I don't grocery shop and do Walmart pick up"
I love post like these!!! I'm impressed with your time management skills! My favorite kind of post! !